Located on the island of Maui, Haleakala National Park was once part of a larger park that also included Hawaii Volcanoes National Park. The combined park, called simply Hawaii National Park, was split in 1961. While Hawaii Volcanoes highlights the dramatic active lava flows of Mauna Loa and Kilauea, Haleakala is home to a dormant volcano which is estimated to have last erupted more than 400 years ago. The park is open all year, and will only close for severe weather. The park’s three visitors centers are open daily, and provide information from rangers, cultural and natural history exhibits, and bookstores with maps and other brochures. Visitors should bring clothes for all kinds of weather. Just because Maui has a reputation as a tropical paradise does not mean it can’t get cold up on Haleakala volcano and other high-elevation areas of the park. Wilderness cabins and campgrounds are the only lodging within the park. Additional lodging outside the park can be found at Kula for the summit area, and in Hana for Kipahulu. Entrance fees for the park are $10 per vehicle or $5 for individuals and motorcycles. Fees are good for three consecutive days. Special permits are required for wilderness camping and use of backcountry cabins, as well as special events and commercial use. Hiking and backpacking are popular activities in Haleakala National Park. Accessible from two mountaintop trailheads, the park’s 24,719-acre wilderness areais ideal for backpacking. Day hiking trails run through lush vegetation and cloud forests, by waterfalls and along deserted coastline. If you don’t feel like campingunder the stars at one of the park’s primitive wilderness campsites, you can reserve one of the historic backcountry cabins. And don’t forget the ultimate vista — the view of the “sculpted landscape” from thesummit of Haleakala volcano will take your breath away. Apart from the park’s majestic natural beauty, guests can interact with the area’s rich Hawaiian cultural heritage. The Kipahulu area has been inhabited by native Hawaiians for hundreds of years. There are plenty of self-guided hikes along this remote stretch of coast, but the Kipahulu visitor center offers unique, ranger-led opportunities to learn about the land and its people. Non-native species introduced by white settlers have negatively impacted Hawaii’s biodiversity. As mentioned above, nene became locally extinct due to the impact of non-native predators like feral cats, rats and mongoose. But an animal doesn’t have to be a carnivore to be a menace. Goats and pigs have destroyed native plant cover, causing erosion, and spread mosquito-borne diseases among Hawaii’s native species. Today, the park seeks to protect natural ecosystems by fencing off the park so that invasive species cannot intrude, but in many cases the damage has already been done. One bird that has felt the brunt of this ecological impact is the honeycreeper. These birds, while related, display a diverse array of physical characteristics that are specialized to their niche habitats. For example, the i’iwi’s bill is specially adapted to draw nectar from certain kinds of flowers. Haleakala means “house of the sun” in Hawaiian. According to legend, the god Maui trapped the sun and imprisoned it on the island in order to lengthen the day. 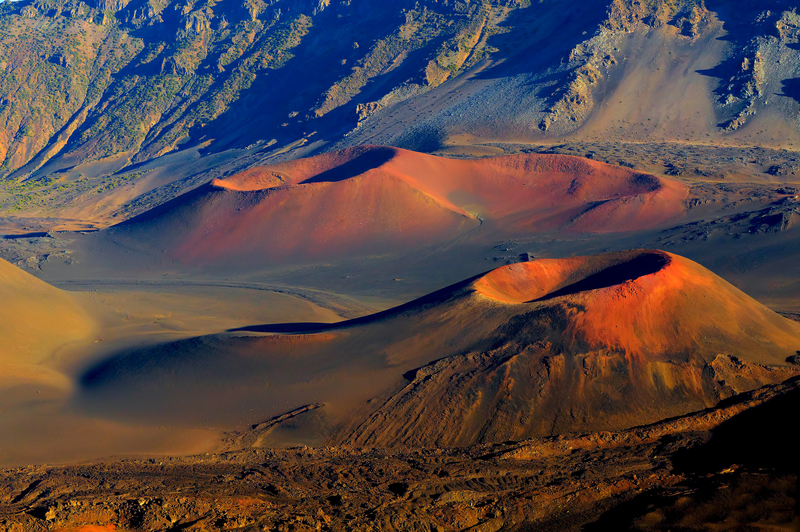 Radiocarbon dating suggests that the native Hawaiians first began using the Haleakala crater between the years 660 and 1030. By contrast, American missionaries and whalers did not arrive on the island of Maui until the early 19th century. Missionaries provided the first written account of the ascent of the volcano in 1828. Industries like sugar making and later, ranching brought settlers to the island. Cattle were grazed on the slopes of the Haleakala volcano until 1922, six years after the park was established as part of Hawaii National Park. Habitat destruction due to settlement and ranching, as well as the introduction of non-native predators like cats by settlers had profound negative impacts on the island’s ecology. For example, the once-plentiful nene — or Hawaiian goose — were extirpated from Maui by the end of the 19th century. Protections put in place upon the establishment of the park paved the road to recovery. Nene were re-introduced to their historic range beginning in 1962, a year after Haleakala became a separate national park. In addition to building facilities like visitor centers, trails, cabins and an observatory in the park (with the help of the Civilian Conservation Corps), the National Park Service would also begin fencing off the park boundary to keep out feral non-native species. This ongoing project continues to this day. 1888 – Haleakala Ranch established. 1898 – Hawaii annexed to United States. 1916 – Hawaii National Park established. 1930s – NPS and CCC build roads, cabins, trails and other visitor facilities in Haleakala area. 1941 to 1946 – U.S. Army occupies Haleakala. Park is closed to public from 1941 to 1943. 1951 – Kipahulu Valley annexed to park. 1961 - Haleakala National Park established. 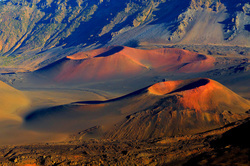 Click to see a detailed Haleakala National Park map.